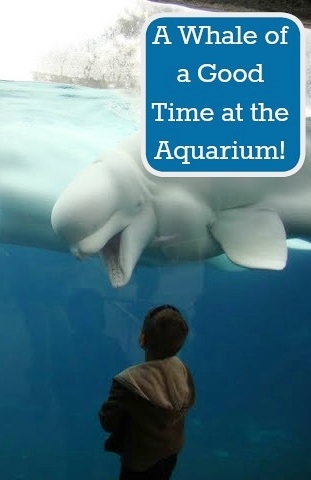 We headed to Mystic Aquarium yesterday afternoon, they just opened a new exhibit for spring break called Scales and Tails that my oldest son was interested in seeing since it was all about reptiles. We arrived just in time to see the Sea Lion show. It's cute and fun and a family favorite so it was a "must see." After the show we went inside to see what this new Scales and Tails was all about. We walked through what looked like a hallowed out tree and where we were able to pet/ touch a reptile (or something with scales and tails). I think we were all a bit disappointed to see a painted turtle. We have those in our backyard! They change the animal frequently throughout the day though, so if we had wanted to, we could have gotten in line a bit later on and had a chance to touch something else. The boys dragged my husband all through the aquarium and we saw the skate mermaid's purse and embryos (who have gotten much bigger-- we could even see skin and spots this time! ), they went to the touch tanks, through the amazon rainforest (where Alec found a new interactive board giving clues about animals-- he guessed every single animal right the first time; usually only reading 1/2 the clues too!). We split up for a bit and while my husband walked around the whole inside of the aquarium with Ian and Evan I stood at a table next to the scales and tails exhibit with Alec. They had set up taxidermied animals, alligator and crocodile skulls, turtle esophagus, etc to see and touch up close. We arrived at the table during a lull in the crowd and Alec had the undivided attention of one of the workers. She started out asking him some very basic questions about animals that I could see he wanted to roll his eyes. Once he expanded on her answers a few times and told her a bit about what he knew she finally said "Wow! You're really smart and know a lot about animals. You must read a lot!" He told her he did but that he also learns a lot about animals by watching a show called Wild Kratts on PBS kids at 5 p.m. every night. Alec knew the squid and octopus were in the same family as the snail and clams (I didn't!). And I thought it was neat to learn that, while these animals can change color they can't see in color! We must have stood there for a good 10- 15 minutes while the other boys explored the aquarium when Ian finally joined us. He asked a few questions and while he was listening to the answers Alec wandered away. I watched him talking to some complete strangers and could see him teaching them something about rock fish. I wasn't close enough to hear what he was saying but he definitely had their undivided attention. It was cute! Evan was getting antsy being inside for so long so we headed outside and saw tons of turtles, fish and bull frogs in the marsh on the way to see the seal, penguins and sea lions and beluga whales. The belugas were really close today and we stayed there for quite a while. My husband took Ian to see the Sponge Bob 4-d show while I took the younger two boys through the Titanic exhibit. They had a new area all about ice bergs opened up and we got to touch an immersion suit, see actual radar buoys they set up and watch a video about the men who go out searching for icebergs. my favorite picture of the day! This looks amazing. I love your photos <3 thanks for sharing! Thank you; it is a lot of fun. The animals are quite interactive.